(AP) It was a hard year in the bluegrass world and the loss of icons such as Earl Scruggs and Doc Watson hung over the International Bluegrass Music Awards on Thursday night. The Gibson Brothers won entertainer of the year and joined Junior Sisk & Ramblers Choice as the only multiple winners at the ceremony at Ryman Auditorium. But the attention of most was turned toward the pioneers no longer able to attend. An emotional Steve Martin paid tribute to the late banjo innovator Scruggs with a special 30-banjo salute that included many of the world's top five-string players. The IBMAs also saluted Watson and players Doug Dillard and Everett Lilly, as well as bluegrass promoter and actor Andy Griffith, all of whom died in the last year. Watson won guitarist of the year posthumously. It was the first entertainer win for The Gibson Brothers, who also took home honors for gospel recorded performance for "Singing As We Rise," with Ricky Skaggs. Sisk & Ramblers Choice won album of the year for "The Heart of a Song" and song of the year for "A Far Cry From Lester & Earl," keeping with the night's unofficial theme. In major categories, top nominee Russell Moore won male vocalist of the year, Dale Ann Bradley won female vocalist, Joe Mullins & The Radio Ramblers were named emerging artist, Blue Highway won vocal group, The Boxcars won instrumental group, Lonesome River Band won instrumental recorded performance for "Angeline The Baker" and St. Jude charity album "Life Goes On" won recorded event. Rob Ickes (dobro), Stuart Duncan (fiddle), Sammy Shelor (banjo), Adam Steffey (mandolin) and Marshall Wilborn (bass) won instrumentalist of the year awards. And 2012 Bluegrass Hall of Fame inductees Doyle Lawson and Ralph Rinzler were honored as well. Though the night was full of spirited performances, none could hold up to Martin's show-ending salute to Scruggs. The actor, comedian and musician seemed on the verge of tears as he paid tribute to Scruggs before inviting players including J.D. 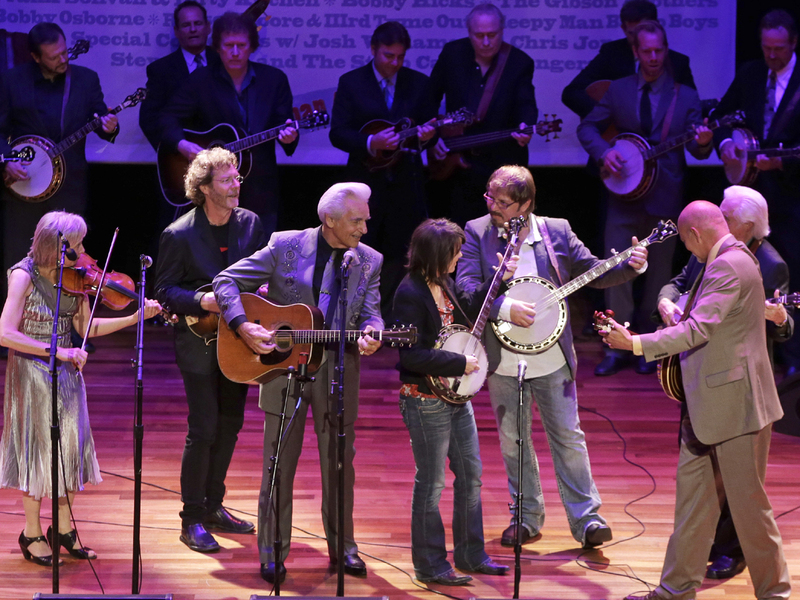 Crowe, Kristin Scott Benson, Sam Bush, show co-host Del McCoury, Lawson, Shelor and Tony Trischka and more than 20 others onto the stage where Scruggs first played his rolling, rollicking style during the Grand Ole Opry. Scruggs' sons Gary and Randy also were part of the tribute. Martin said in an interview before the show that he was inspired by the Kennedy Center Honors when conceiving of the Scruggs tribute. "They like to do these big salutes and I thought why not here at the IBMAs for Earl," Martin said. "All the banjo players who've been influenced by him, why can't they all be here and pay tribute to him?" McCoury, inducted into the Hall of Fame last year, said he would probably not have gotten into music had it not been for the Flatt & Scruggs record his brother bought in 1950. The 11-year-old McCoury was transfixed by Scruggs' playing. "I just could not get that sound out of my head," McCoury said. Mandolin player Bush joked he was playing rhythm banjo while on stage, but said he felt privileged to be involved. "I knew Mr. Earl," Bush said. "It gets real emotional as I look at Randy and Gary standing there and how they must feel, and how everybody loved their dad. He was a true gentleman. Nobody's more deserving of accolades than him."